I'm running Windows XP SP3 RC1. I'm a software developer and an advanced windows user. Usually I am able to clean infections manually without needing any tool, but this is really baffling me. I went to the "You must read this first" thread, but I'm not able to run any of the antivirus/antimalware tools, AVG. Some run for a second or so before automatically terminating, others show a message box saying the .exe is not a valid Win32 application. Ccleaner and Spybot S&D run for a second. AVG antivirus, and hijackthis give me error 193 invalid win32 application. Trying to rename/delete/run some of the executables for the above mentioned tools manually causes explorer to freeze (I kill it and restart it manually with the task manager). Further more, I cannot enter into safe mode. I'm able to run Kaspersky's online scan, and its running currently under IE (I'm using Firefox to write this, and for all other open pages). So far it hasn't found any infections. Any help fixing/cleaning my PC is greatly appreciated. Edited by IraqiGeek, 28 February 2008 - 09:01 AM. You have a bagle infection. Set to "Always ask me where to Save the files". 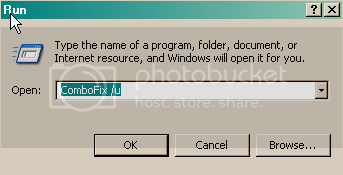 It is important you rename Combofix during the download, but not after. Please do not rename Combofix to other names, but only to the one indicated. Double click on combo-Fix.exe & follow the prompts. Please post the "C:\Combo-Fix.txt" along with a new HijackThis log for further review. Thanks for the prompt reply. I run combofix, then run hijackthis afterwards. 2008-02-05 16:40	---------	d-----w	C:\Program Files\Yahoo! O4 - HKLM\..\Run: [frymxins] "C:\Program Files\ATI Technologies\Fire GL 3D Studio Max\atiimxgl"
Please submit the following files to one of these online file scanners. This will produce a report after the scan is complete, please copy and paste those results in your next post. I still run it through VirusTotal, its still scanning and it didnt find anything. Run Malwarebytes' Anti-Malware, AVG Antivirus and Spybot Search & Destroy and all didn't find any infected files on my system. I ran kasparsky's webscanner earlier today, before I posted on these forums, and it was VERY slow. It took it over 3 minutes to scan a 1.4MB installer of one of my apps that contains 8 files totalling a little over 4MB unpacked. Ok well go ahead and uninstall Malwarebytes antimalware. Thanks a lot for all your help. I really appreciate it. I know exactly how, when, and what got me infected. Its just that I couldn't find any malicous process running, which baffled me as to what was happening.